One of the best ways to improve your smile in Santa Barbara cosmetic dentistry is veneers. Thousands of Goleta and Montecito smile restoration patients who have received veneers are happy with the results. Santa Barbara veneers are a minimally-invasive procedure for transforming Santa Barbara smiles. 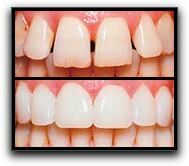 Veneers at King Dental Group are incredibly thin shells that adhere to the face of teeth. Most Santa Barbara veneers are about the thickness of two pieces of paper. Because the color is built into the veneers (instead of being applied after fabrication), they look like your natural teeth–only better! Our experienced California ceramists are skilled artists. They create each custom veneer with the optimum shape, color and thickness for your new smile. Take a positive step toward your dazzling new smile!